"You'll need to donate $50 to my church" was his opening gambit when I asked to photograph the man with the long black sutan. Father Andrews hails from Dallas, Texas and stood out from the MCG size crowd with his cowboy hat. 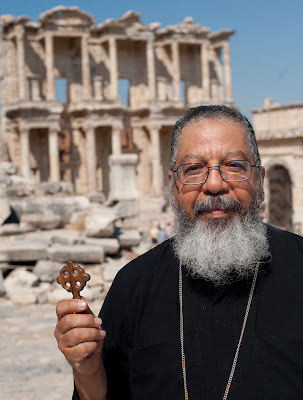 As a religious leader of the Coptic Church in Texas he agreed to barter on the shoot fee. I agreed to say a prayer for him and we quashed the fifty buck fee. 'Now let's do this right' he said. He put hi right hand in his pocket and took out his wooden cross.